I saw this poster at Itaewon station the other day and it wins hands down as most exciting advertising mistranslation of the year. Great find. Happy New Year! Even aside from the "...역 번..." ("번역"?) 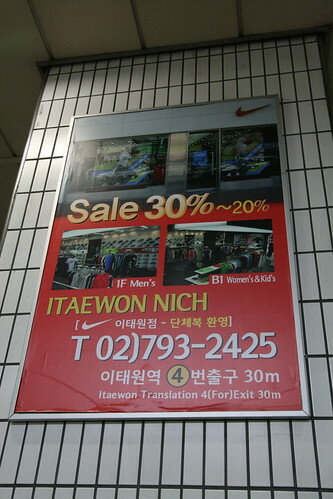 error, misspelling "Nike" as "Nich" requires a monumental handicap in typing ability. Happy New Year to you Breda! Holterbarbour, I would love to meet their translator/typist. If only to thank them for the joy they bring to my life when I walk through Itaewon station.